As we have previously discussed, consumers or applicants are entitled to receive a copy of their file. 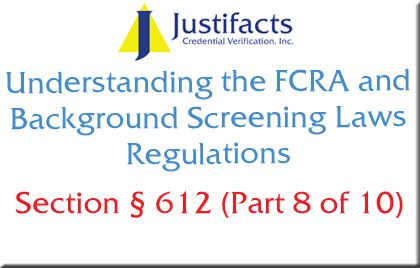 Section 612 of the FCRA discusses if/when it is appropriate to charge a consumer for his/her file. Each consumer reporting agency that maintains a file on a consumer shall make all disclosure without charge to the consumer, if, not later than 60 days after receipt by such a consumer of a notification of either pre-adverse or adverse action from an employer, the consumer requests a copy of his/her report. 3. Has reason to believe that the file on the consumer at the agency contains inaccurate information due to a fraud. In the case of a request from a consumer other than a request that is considered above, a consumer reporting agency may impose a reasonable charge on a consumer for making a disclosure to the consumer. This charge must indicate this to the consumer before making the disclosure. The Federal Trade Commission set the maximum charge at $11.00, effective January 1, 2011. Under the above-mentioned circumstances, applicants can request a copy of their file, free of charge, once in a 12-month period. Organizations can charge a fee of $11.00 or less if the conditions of the free disclosure have not been met.